Joop! Jump is the perfect fragrance for men who love outdoor adventures. Joop! Jump 100ml. Eau De Toilette is for the modern man . Fresh,invigorating and alluring. Jump is a masculine scent of rosemary, grapefruit, vodka, voriander leaves, thyme, heliotrope, vetiver, tonka beans and musk. Joop jump is recommended for daytime wear. Perfume Joop! 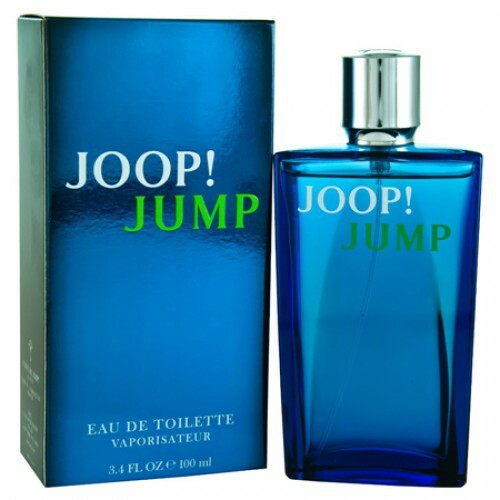 Jump released to the public in 2005, perfume house of Joop! Its creator German designer Wolfgang Joop. He has developed a composition which is intended for young, energetic, confident men. True men, strong and invigorating fragrance is refreshing thoughts and feelings, uplifting forces to believe in yourself. He takes us to the seaside, gives an unforgettable sense of freedom. When you inhale the aroma of perfume compositions, it seems that small droplets of sea water with the waves break and freshen the face of the weary traveler. This effect is achieved thanks to the unique components of the fragrance, including the present frozen vodka, mixed with grapefruit juice. This mixture acts as energy cocktail, cooling the skin and released into the blood large portion of adrenaline. Perfume can be used both day and night, on the eve of the day, and before the party. In short, when you need to cheer up and give yourself a little extra vitality. Carefully selected ingredients fragrance Joop! Jump woven into a bouquet that expresses the concept of flavor. Top notes of perfume presented grapefruit, which gives energy and refreshing. Slightly soften the effect of rosemary and thyme, as if they Riddler, who wants to solve every woman. Juicy cherry flavored with coriander, slightly bitter flavor and makes the owner feel more confident. What effect has frozen vodka, men do not need to tell everyone knows the sensation of flight, that appears after eating a small amount of high-quality liquor. Classic trail of spices and herbs harmoniously completes the perfume composition, leaving the owner of the perfume light sensual fragrance. The design of the bottle of eau de toilette Joop! Jump in the style, emphasizes the refreshing effect of perfume. The bottle has a streamlined shape, as if it aspires upwards. It is painted in blue, the name written on the glass fragrance.